One of the things I love best about Pure Green is the larger community of creative people that we are a part of, and a shining star in that community is today's guest, Renee of the blog Will Frolic for Food. Renee is known for her beautiful, inspired writing, her excellent photography and styling, but what I love best about her blog is that it's joyful. Everything Renee writes about and creates feels decadent, like you're treating yourself, despite the fact that her recipes focus on super healthy, plant-based food. It's never about depriving yourself on Renee's blog and flavour takes the driver's seat. Renee is a well-balanced, beautiful person, and I was excited to talk to her about her creative life and passions. Renee reveals a lot about herself in the interview, and perhaps best of all she's very real, admitting fully that life wasn't always easy and providing lots of tools to help move through difficult times. 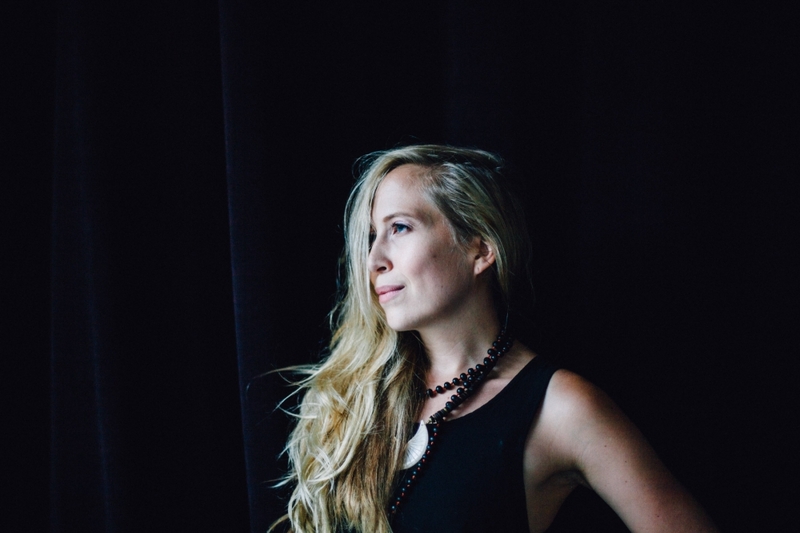 We talk about her blog, her dedication to her yoga practice, and then chocolate too, as Renee is also a part of Frolic Chocolate, a bean to bar start-up chocolate company. Renee is also a contributor to Pure Green, and most notably she's a community leader for the summer phase of the Pure Green In Season cookbook, which, by the way, we're currently accepting submissions for, so if you're a food blogger or writer, go to puregreenmag.com/puregreeninseason for details. Ok, let's dive right in, it's a great episode! "Dreams are a slippery thing, gossamer and liquid. I sometimes spend a week working out a dish I’ve only tasted in the depths of sleep." 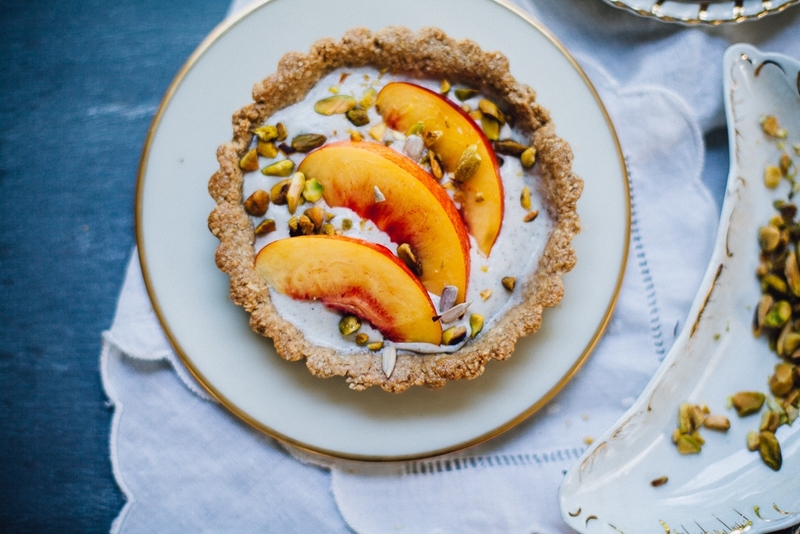 Shown Above: Renee's Vegan Nectarine Pistachio Tart, her contribution as Pure Green In Season community leader. Get the recipe & submit to the project! Renee takes us inside her world and helps us get to know her. The directionher life took in order to lead her to where she is now, such as battling with anxiety depression & the difference that backpacking solo in Europe made for her. The meaning that food has for Renee, and where that love stems from. Why she chooses to eat and write about vegetarian and largely vegan / gluten-free food. Her joyful philosophy on food, and talking about joy as a natural state of being. The place yoga has in her everyday life, and musing on the Ayurvedic meaning of yoga in contrast to the place of yoga in the modern world. Renee walks us through her creative process, how her ideas often stem in the dream world and how she extracts flavours previously only dreamed about into a tangible thing? Her third passion, a really fun one... chocolate, and talking about her Frolic Chocolate, the business that she's developing with your husband Logan. What defines good, healthy chocolate, and the benefits of eating it. Discussing the bean to bar process and sustainability in the chocolate industry.